"I felt completely inferior at Berklee. I would just marvel at the way some of these guys were playing the guitar. I very rarely would play around them, but every morning all the monsters would gather around a huge table in the cafeteria and just blaze. It was uncanny how some of these guys played. One in particular was the most astonishing guitar player I ever saw or heard. His name was Lorn Leber. A really kooky funny guy, Lorn was a genius. He could make up a synthetic scale and know it all over the entire neck of the guitar in an hour, complete with every chord inversion possible and impossible. His style was very fusion (sort of Mahavishnu John McLaughlin). To this day he is without a doubt the fastest guitar player I have ever seen (yes, even faster than Yngwie). All these shredders would sit at the table and try to keep up with Lorn. He would motor along and they would feverishly try to keep pace. Then Lorn would look at me, wink and smile, and then blast into infinity and beyond. Everyone would shudder in disbelief, throw their pick on the table and back away. We would watch this guy play and just laugh." 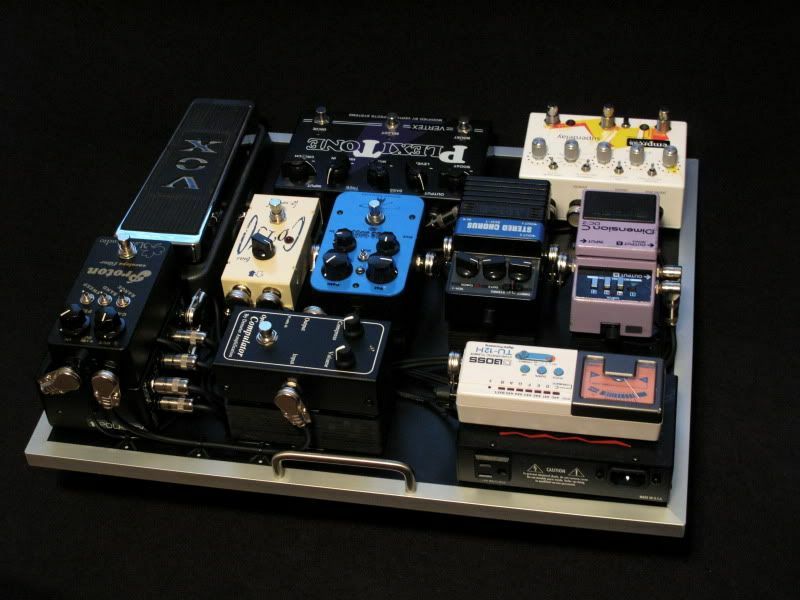 Lorn was looking for something compact with the ability to be modular depending on what each gig or session requires. We outfitted Lorn with a custom Vertex Tri-Buffer interface with a standard input buffer and an added tuner out. It also includes dual output buffers with one (1) transformer isolated output on the RIGHT out so that he could run the system in stereo without a ground loop. There is also a polarity switch on the back of the interface to ensure that when in stereo, both amps are set to the proper polarity. 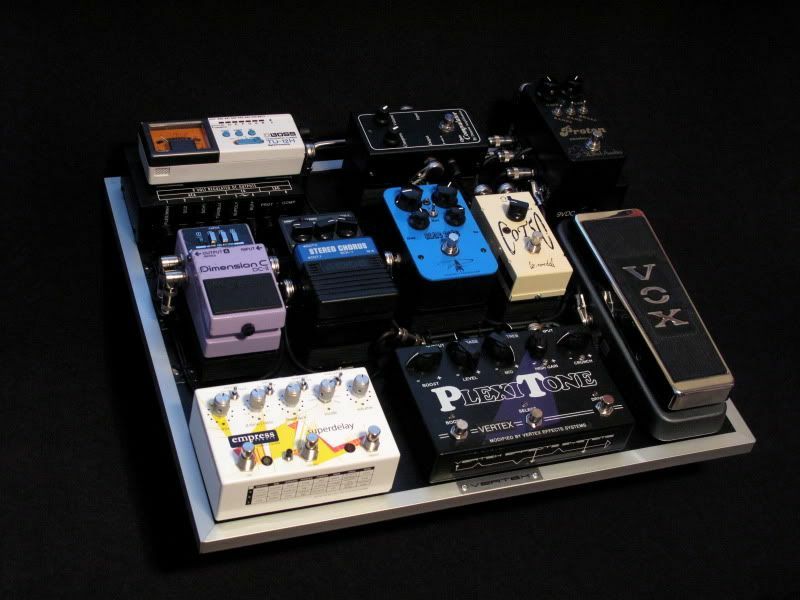 We also added an effects “break-out” so that Lorn could add a volume pedal or other pedals off of the pedalboard after the distortion section, but before modulation and delays. The break-out is only active when there is something plugged into the SEND/RETURN jacks, otherwise the signal path will pass through normally with the pedals in series. 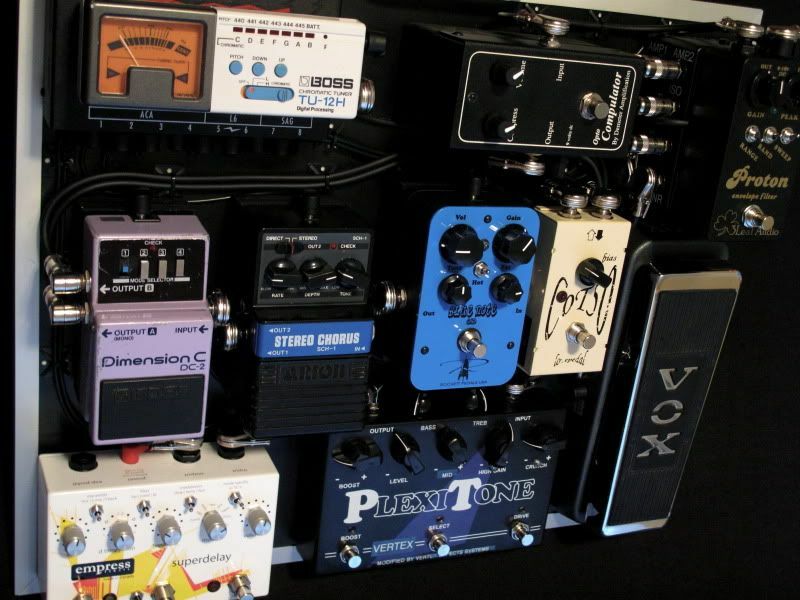 INTERFACE (input buffer w/tuner out), 3Leaf Audio Proton Envelope Filter, Demeter Opto-Compulator, Lovepedal COT50, Vox Clyde McCoy Wah, Rockett Blue Note, Vertex Plexitone, INTERFACE (effects break-out), Arion SCH-1 Chorus, Empress Superdelay, Boss Dimension C, INTERFACE (dual output buffer for stereo set-up + ISO transformer on the R output).